First, let's talk about Though The Fire’s Arrow. This sample came in an impressive tub of hard plastic with the same colorful label and screw on cap. 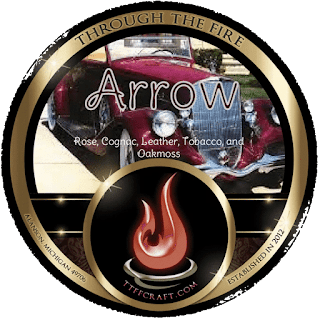 The scent is extremely intoxicating with notes of Damask Rose, Cognac, Leather, Tobacco, and Oakmoss combine to create a smoldering musky floral scent, a must try fragrance. I bowl lather and Arrow did not disappoint. It was extremely easy to place into a bowl and I whipped up a lather in less than a min which was rich and creamy and gave great coverage. It got right into the beard and provided me with the sickness and glide that made it possible to go over trouble spots with ease. The post shave feel was one for the books a great shave was had this day for sure. The topper was the foam aftershave by Joesph Meyer. 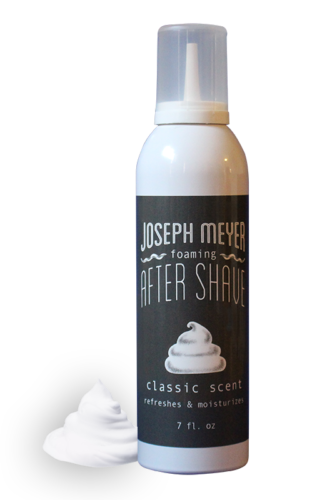 This innovative foaming emulsion combines the toning, invigorating zing of a traditional alcohol aftershave with the soothing comfort of a modern moisturizing balm and the scent on this is just like sitting in a barber’s chair. A call back to the vintage shaving scents that are sure to please. I only placed a small amount in the palm of my hand and then began to work it in. It felt so good and the fragrance was so intoxicating that I went back to it again. I can’t seem to get enough of this once I start. I even use it before I go to bed. Call me crazy but I really dig this stuff. So with some reviews we always have downsides and here is this one. This stuff comes at a price. For the 7fl oz bottle, this sells for $30.00 that's $4.30 an fl oz which for most is on the high side but as performance goes your eliminating a few products just by using this one so it kind of evens out in the end.